Just 4 simple steps to start managing projects on SharePoint in under 5 minutes. The BrightWork free template can be deployed within 5 minutes with no coding needed. Easily structure your work into a SharePoint project management site with confidence. Trusted by over 40,000 organizations the Free Template is available on SharePoint 2010/2013/2016/2019. Improve collaboration and leadership in your project team with task lists, document management and web-accessibility. No credit card, no obligation! We have configured SharePoint for project management, so you don’t have to! Unlimited projects for unlimited time. Manage as many projects as you want for as long as you want with the Free Template, no strings attached. The free template plugs into your existing SharePoint infrastructure – no coding required. Bring all project information into one place for better visibility and easy collaboration. 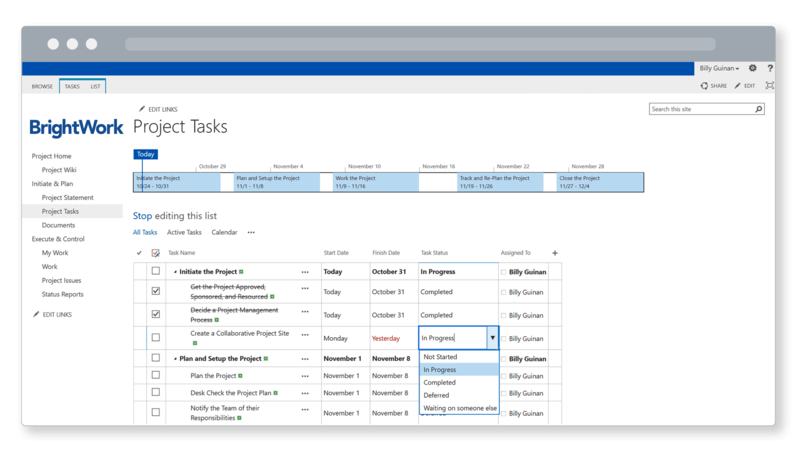 Use the ‘Get Started Tiles’ to plan your project with a project statement, project tasks, and a document library. Track project progress and help your team to work their tasks with visual, intuitive reports. With the ‘My Work’ report, your team can find, do, and update their work easily. Use ‘Project Issues’ and ‘Project Tasks’ to deal with problems before they derail your project. The project homepage is updated in real-time, making communication with the team and stakeholders seamless. Check and update your project plan – without lengthy email chains or meetings. Use ‘Key project metrics’ on the project homepage to find late tasks. Take action to get work back on schedule and update the project timeline. Create a project status report with metrics, KPIs, and comments about the health of the project. BrightWork is a driving engine in the Amazon way of Project Management. In just 3 years we have grown to 300 different groups using BrightWork, with more than 28,000 active users.